Le Blue Guest House - Bluewater Bay Accommodation. Bluewater Bay is one of the nicest and most convenient areas of Port Elizabeth in which to stay, whether as a corporate visitor on business or as a holidaymaker. For the holidaymaker the great attraction of Bluewater Bay is the many kilometres of wide, sandy beach and the mouth of the Swartkops River. Between them, these offer great opportunities for swimming, angling and all sorts of water sports. All the amenities of Port Elizabeth are a short drive away and the south gate to the Addo Elephant National Park is just 20 minutes away. Within a short walk of both the beach and the river lies Le Blue Guest House. This immaculate establishment is as clean as a new pin and offers you comfortable and well appointed B&B accommodation for your stay with friendly and efficient, but never intrusive, service. Enjoy a hearty English breakfast in our guest dining room for a good start to your day and a plunge in the spotless pool to cool off in the afternoon. Dinner is available on request from Monday to Thursday, please enquire about rates. Just a few minutes' drive up the freeway from the new harbour and the Industrial Development Zone at Coega, Bluewater Bay is also just a short drive from Deal Party, Markman, Struandale, Korsten and the city centre of Port Elizabeth. This makes Bluewater Bay exceptionally suitable for the business visitor as well as being a quiet and attractive, up market suburb. Fax and copying facility are available at the reception. Secure off-street parking. airport shuttle can be arranged. 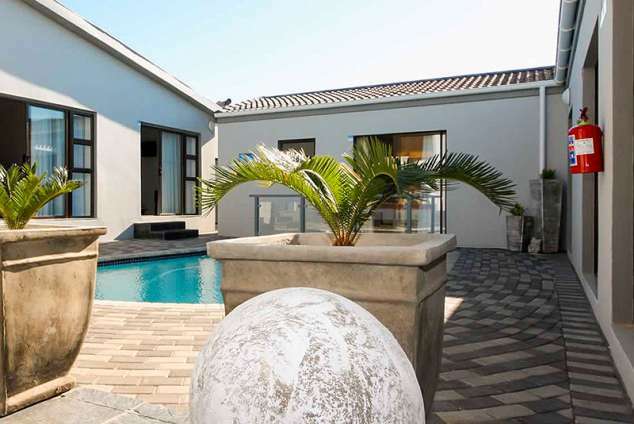 Le Blue Guest House offers you the choice of eight comfortable and stylishly individualised rooms, each with its own entrance to the pool area. All our rooms come with complimentary tea and coffee making facilities, safes for your valuables, flat screen TV's with DSTV, bar fridges, hairdryers, fans and heaters. Extras available at Le Blue Guest House are a free internet facility, fax and copying facility, an outdoor braai (barbecue), secure off-street parking, airport shuttle (for your account) and a laundry service (for your account, depending on the quantity). This room has an en-suite bathroom with a shower, toilet and basin only. This room is equipped with a queen size bed. This room is equipped with a queen size bed as well as a single bed. This room has an en-suite bathroom with a bath, shower, toilet and basin. This room is equipped with single beds. Corporate and long-stay rates may be negotiable; please enquire. For the comfort of other and future guests we have a No Smoking policy indoors. Smokers are welcome, to indulge in the outdoors. We regret that we are not in a position to accommodate pets and that children under 12 years of age also can not be accommodated. Reception hours are from 07H00 to 20H00. Surcharges will apply for out of reception hour arrivals. 288 page views since 05 Jul, 2018. Last updated on 07 Aug, 2018.